Hydrogen on semiconductor surfaces has been an area of considerable activity over the last two decades. Structural, thermal, and dynamical properties of hydrogen chemisorbed on crystalline silicon and other semiconductors have been studied in great detail. These properties serve as a reference for related, but more complex systems such as hydrogen at multiple vacancies in crystalline semiconductors or at microvoids in amorphous samples. Interesting from a surface physics point of view is the fact that hydrogen as a monovalent element is an ideal terminator for unsaturated bonds on surfaces and therefore tends to have a large influence on surface reconstruction. A related phenomenon with large technological impact (for example in low cost solar cells) is the passivation of grain boundaries in microcrystalline semiconductors. Finally, hydrogenated semiconductor surfaces always appear as a boundary layer during low-energy hydrogenation of bulk semiconductors, so that a complete description of hydrogen uptake or desorption necessarily has to take these surfaces into account. This collection of invited and contributed papers has been carefully balanced to deal with amorphous and crystalline semiconductors and surfaces and presents basic and experimental work (basic and applied) as well as theory. 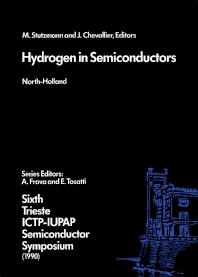 The resulting volume presents a summary of the state-of-the-art in the field of hydrogen in semiconductors and will hopefully stimulate future work in this area. Preface. Introduction. In memory of Günther Harbeke. 1. General reviews: hydrogen in and on crystalline semiconductors. Papers by: N.M. Johnson et al., C.H. van de Walle, R.F. Kiefl and T.L. Estle, J.A. Schaefer, R.A. Street. Hydrogen diffusion and effusion Papers by: S.J. Pearton, J.W. Corbett and J.T. Borenstein, F. Buda et al., W. Beyer, R. Murray, P. de Mierry, A. Etcheberry and M. Aucouturier, R. Rizk et al., R. Rahbi et al., M. Vergnat et al., X.-M. Tang et al., F. Demichelis et al. 3. Hydrogen related states and defects. Papers by: Yu. V. Gorelkinskii and N.N. Nevinnyi, A.A. Bonapasta, R. Jones, J. Tatarkiewicz, W.B. Jackson and S.B. Zhang, J. Weber, M. Singh, J. Weber and M. Konuma, P. Deák et al., M. Kondo, H. Yokomichi and K. Morigaki, A. Szekeres, S.S. Simeonov and E. Kafedjiiska, J. Keinonen et al., M. Stutzmann et al., B. Dischler, F. Fuchs and H. Seelewind, X.T. Meng, L. Meda et al., H. Labidi et al., J. Serra et al., R. Galloni et al., A. Asano, M.J. van den Boogaard et al., J.H. Neethling. Hydrogen complexes. Papers by: G.G. DeLeo, J.B. Boyce and S.E. Ready, M. Gebhard et al., M. Stavola, M. Deicher et al., E.E. Haller, T. Zundel, J. Weber and L. Tilly, A.L. Endrös, W. Krühler and J. Grabmaier, B. Pajot, B. Clerjaud and J. Chevallier, L. Pavesi and P. Giannozzi, Pr. E. Constant, R.C. Newman, P.R. Briddon and R. Jones, B. Theys et al. 5. Surfaces and interfaces. Papers by: C.M. Bertoni et al., S. Nannarone and L. Sorba, Y.J. Chabal, F. Proix, M. Aucouturier, Th. Allinger et al, U. del Pennino et al., J.J. Koulmann et al., P. Raynaud, J.P. Booth and C. Pomot, A. Akremi, J.P. Lacharme and C.A. Sébenne, A. Stesmans and G. van Gorp, Y.G. Wang and S. Ashok, B.I. Craig and P.V. Smith, Z.-y. Wu et al., H.C. Neitzert, M.A. Briere and P. Lechner. 6. Hydrogen incorporation and defect passivation. Papers by: T. Ito et al., A. Bosacchi et al., B.N. Mukashev et al., L. Svob et al., I. Perichaud, H. El Ghitani and S. Martinuzzi, D. Yang et al., M. Capizzi et al., N. Blayo, P. Blom and B. Drevillon, V.I. Marakhonov et al., G. Suchaneck, M. Albert and K. Schade.. List of contributors. Subject index. Max-Planck-Institut für Festkörperforschung, Stuttgart, F.R.G.